ArcLight is doing great this April, just wrote about a special Q&A for It Follows, but that film has nothing on the sheer insanity of Roar. Filmed over eleven years with many of the cast and crew being attack and hospitalized, it is a film with real lions, and tigers! Roar is an utterly bizzare film of a family returning to meet their estranged father after years of him running a house animal preserve of real live animals. 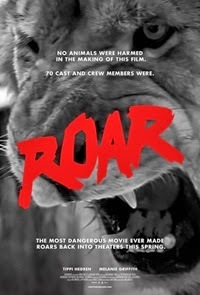 Roar was recently picked up by DraftHouse Films for redistribution on home video and theaters. We're getting a early treat in seeing one of the scariest films out there, because those actors can really get hurt...and did. See it Saturday, April 16 at 7pm. A Q&A follows with Roar star John Marshall. He'll tell you what happend on set and how he survived it.